There are several things you need to remember when choosing a collar. It must be safe for your dog’s health, comfortable, reliable, easily adjustable and, of course stylish! Well, this Amazing Leather Dog Collar will provide you with all of these features and even more! It has a special handle that will help you to achieve higher results during agitation trainings. By purchasing this collar, you receive a piece of multifunctional dog equipment that can be used not only for training, but also for walking purposes. If you want your dog to wear high quality equipment, then this collar is the best that you can choose! 1. The collar is made of 100% full grain genuine leather. We choose only best materials to manufacture our products and this one is not an exception. All metal parts are made of brass and, as you know, brass is a metal that is resistant to rust and corrosion. All these makes the collar durable and reliable equipment that will serve your dog for years. 2. The collar is easy in use. 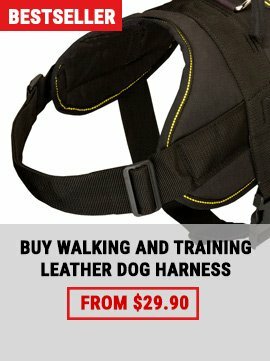 It is easily adjustable and is a perfect choice for young dogs, because you will be able to re-adjust it without any problems if your dog gains/loses on weight. 3. 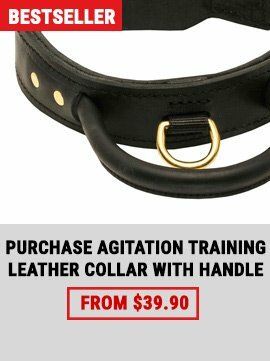 This collar is an irreplaceable thing during different kinds of training. 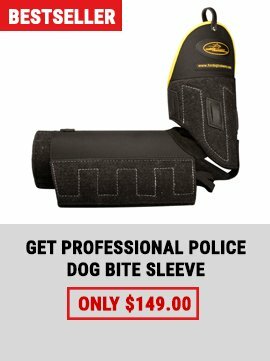 It has a special handle that will allow you to control your dog better in some critical situations. And it is also suitable for walking - you can attach a leash to a special D-ring. 4. You can be sure that your dog will look cool and stylish while wearing this collar. It has simple and strict design, your dog will look like a true guardian while wearing it.